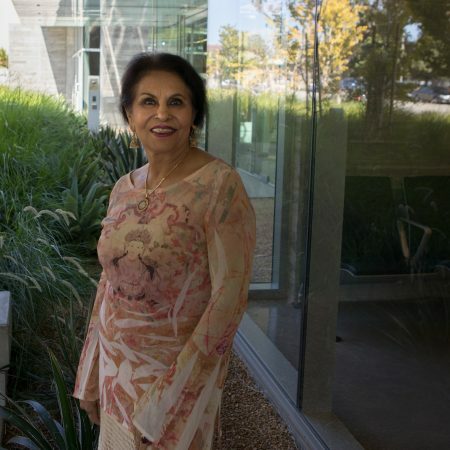 I was recovering from a quadruple bypass and getting healthy when I found out I had breast cancer," says Raj Dhillon, who found out she had HER2+ cancer, a genetic form of breast cancer that she shared with her twin sister, Tej Bains. "My sister had stage 2 breast cancer, mine was stage 1. I had a lumpectomy, then chemotherapy and radiation for four weeks. My twin and I started radiation on the same day. Same time, same day, and I did it for four weeks, every day. She did it for six weeks, every day. I was her caretaker at the same time as I was going through my own treatments, so there were really tough moments. But the support of the doctors and the support of my daughters kept us moving. The journey has been wonderful and full of supportive people, from the UCLA Breast Center Santa Monica to the doctors, oncologists, radiologists and my whole team. I feel very blessed.